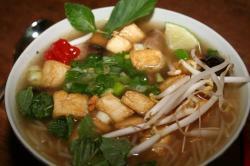 ellie may website, which was the first google hit for “vegetarian pho”. Clare actually did much of the work on this one. We found an Asian grocery store today, which among other things had a pho spice mix, which came in a teabag. That made some very tasty broth. We also got fresh rice noodles, and I must say that I did a nice job of frying up the tofu. I made a goal to make 52 new recipes in 2009, averaging one per week. I am tracking my progress on kibotzer.com which is a new website designed to help people track goals. The main idea is to “stay on the yellow brick road”, which you can see in the graph there that it generates for me. This entry was posted in cooking and tagged pho, vegetarian, vietnamese. Bookmark the permalink.